Driving and working on vintage cars and restoring and listening to vintage valve radios, radiograms and phonographs. I'm starting to think the gears are stripped, anyway I'll make that assessment later when I have my spare gearbox here and a Dodge manual. I'm going to have to fix it in my driveway because I don't have a shed, just tarpaulins. Yes Wayne, that's the one. Yes I think what you have described is the problem as it seems to drive ok in second, just not in reverse and first is now bad since reverse went, which is how I discovered second was fine, I used second to park it back in the driveway. Yes it is a ute of sorts, but often the older ones with flat trays like mine are called buckboards. The gearbox started making a noisy whirring sound in neutral last year after ascending a very steep hill in second and then firs and I later discovered the gearbox was low on oil, which I topped up, but I think the damage was done and when in my driveway, with the inspection plate off the gearbox and the engine idling, I held the clutch all the way in with firstly reverse selected and slowly released the clutch, it looked like the lower shaft was shaking from side to side at the front, but in first, similar, but the car did move forward. I'm a mechanic, so yeah I won't be driving it until it's sorted. I've got a good spare gearbox I want to put in to keep it mobile while I pull down the old and rebuild it. I just can't find any manuals detailing the procedure, the oldest car I've pulled the engine and gearbox in and out of and rebuilt was a 52 Plymouth Cranbrook and this is a totally different ball game, but I'll just have to proceed slowly and methodically for the time being! Thanks for your reply Wayne, appreciated. Hi. I'm a mechanic, but I've never removed a transmission from a Dodge Brothers before. Mine is a 12v starter Generator type Dodge (slow) 4. 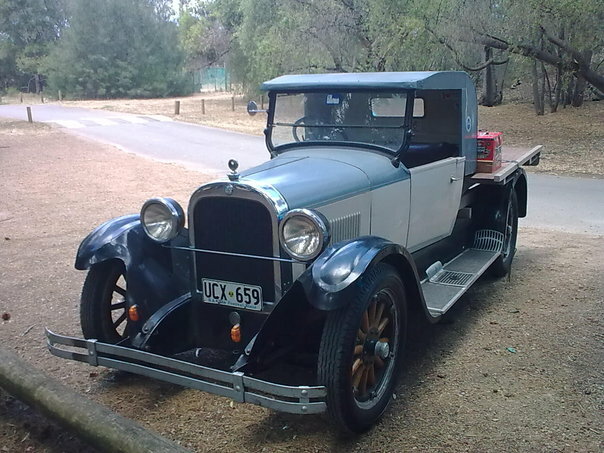 1926 Australian RHD, I think that makes it late 25 manufacture. My gearbox has lost reverse and 1st, I think there's sideways movement in the layshaft, bearing gone. Can anybody please describe the process for removing the transmission from the car. I do have a spare gearbox, which I would like to fit to keep the car mobile while I rebuild the old one. It doesn't appear to have bolts to separate the box from the bell housing, being all in one. I'm guessing that I have to unbolt the rear springs and roll the rear axle back with the chassis supported to disengage the tailshaft from the universal joint. Does the exhaust also need to be removed? Floorboards obviously would need to come out. If I remove the clutch/ flywheel under-cover and support the engine on a couple of bottle jacks and undo the gearbox/ engine mount/ cross member bolts to the chassis, then the engine to mount bolts, will the gearbox pull back from the clutch and come out without a fight? Can somebody please advise me? Thank you. JB. Hi, the last few times I've gone to take my 26 dodge brothers buckboard for a run the gearbox has made a horrible noise as I reverse out of my driveway, which is inclined upwards to get out. Today it was worse than ever and the car was jumping as if the gears were slipping, to the point I couldn't get the car out of the driveway. Then It started doing it in first gear too and I had to start in second to pull back in and park it up. It seems fine in second but first and reverse are now not working, I can let out the clutch and it just sits there making a horrible noise. When I look in the top of the gearbox, everything looks fine, but it's obviously not. Firstly, does anybody know what could be the problem? Secondly, I have a spare gearbox which is in pretty good condition, but I can't see any bolts so I can remove the box from the bell housing. Does anybody have a manual or are able to describe the process involved in removing the gearbox so I can swap them over? I understand I'll need to drop the rear axle and pull it back to disengage the tail shaft from the universal joint, beyond that I'm scratching my head? Will I need to somehow support the rear of the engine and remove the whole gearbox and cross member in one unit? I'm wondering how it unbolts from the engine as it appears the gearbox and bell housing are one piece? It leaks and it's been a decade since I've added any. I haven't checked it for 7 years, in the years prior to that when I did keep an eye on it, it never needed any. There's always a couple of small drops under where I park it if I go for a decent run, so probably natural attrition, I'll just need to check it each time I go over it with the grease guns, about 3-4 times a year. I checked my gearbox and it was down on oil, It took a litre to bring it up to the mark. I took it for a run today around 20 km. At first the gearbox made a strange whirring noise in neutral with the clutch engaged, it was sticky in third for a while but at the end of my drive it was behaving normally again! So hopefully it was just unhappy and letting me know to top up the oil, as it seems ok now. I think this summer I'll drain, flush and refill the gearbox. Hi! 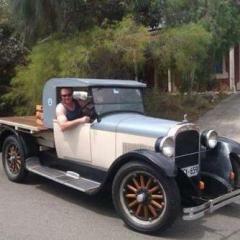 Today I took my wife for a run in my 1926 Dodge Brothers buckboard. We travelled about 15 km and when I came back in town she was well warmed up and running well, but when I slowed to turn a corner and shift down I clutched and attempted to pull out of top (3rd) gear into neutral and it seemed stuck, until I gave it a decent yank. I usually de-clutch once in neutral and give it a rev before clutching and shifting to second, but I've never had it stick in top before, it usually slides out easily so I'm wondering what might have caused it to stick in top. Once I come to rest it comes out easily or if I give it a good yank, but I've never had to force it before, so I'm wondering if it has developed a problem which will need attention? Interesting to know as one day I'll have to do this when I eventually rebuild mine. 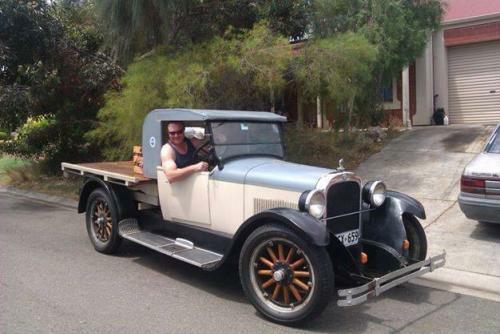 I've done a blue apron job as I haven't got much income and my Dodge Buckboard was stolen in 2015 and after 18 months, somebody put it up for sale on a facebook page and luckily a mate took a screenshot and sent it to me, which I took to the local police, and the next day they phoned me to tell me they had my car! Phew. Only problem is whoever stole it must have thrashed the daylights out of it and when I started it up there was a horrible knocking. When I removed the sump I found the babbit from no. 3 & 4 cylinder all in the oil pan, stuck to the sides and bottom. Fortunately I have another old engine in reasonably good condition, a block with crank, pistons valves and bearings, so I swapped over the 3 & 4 bearings. First I ground the ridges off the crank with a emery and a bootlace and CRC, starting with 400 grade using every grade of a hundred up until 3000, at which time it was smooth as silk. There was a bit of up and down play, and it always had a bit ever since I bought it and it's never been a big problem in the 20 yrs I've had it, but I used a dyn-afile and filed the shims down between the caps. The first one I took a bit too much and when I tightened it I it was hard to turn, that was about .060", so I ended up taking .040" off each shim and it got rid of the up& down movement, basically as explained in the "book of information" and so far it's been running great, I haven't taken it on a long trip yet, but it's running sweet with no knocks or issues! Touch wood. These old engines are fairly forgiving as long as there's oil pressure and water in the radiator! You've gone to a lot of trouble, I've always considered a drip from the pump glands par for the course and keep an ice cream container under the pump when parked in the garage. If the packing is in good condition, it will only drip slightly and seal up after a few minutes once parked. I always check my radiator level before driving and keep a flagon of water on board in case it leaks. If I get a decent amount of water in the ice cream container and/ or notice a few more than the odd one or two drips when idling, I tighten the nut until it stops. I've just replaced the packing rope for the second time in the 20 yrsI've owned mine as it wouldn't stop leaking with tightening and the ice cream container would overflow when parked and I'd lose too much coolant, so I've repacked it and its good again. It's a very fiddly job, you have very little clearance and must pick out every bit of the old spent packing, then use a razor blade to cut a new piece. I just use quarter inch pump packing graphite rope. It's better to have it a sixteenth too long than too short and you'll know when it's right or a tad long because it will be a devil of a job to get the washer in and the thread to engage in order to tighten it, but once you succeed it'll be good for another 20 years!